National Championships: I’d love to be able to give you the information you’ve all been waiting for – and those in the Regional State Squad were confident we would be bringing to you – but it was not to be. 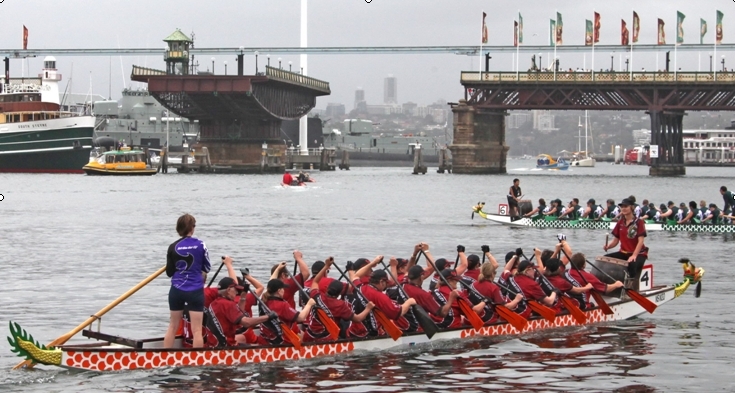 Race 2 – in a closely contested race between NSW, Queensland and South Australia a member of the South Australia crew collapsed. Medics were unable to revive him. It was necessary for AusDBF to cancel the 2012 State v State Championships. Club races scheduled for rest of the week are in progress as I write. Juniors competing with the Torpedoes – I haven’t been able to find any results for them on line and my calls to the juniors, have not been returned, not sure if that’s a good thing or not, but if anyone has heard of their progress – I’m sure the rest of the club would like to hear. Winter Training – just reminding everyone: Training has moved to Saturday mornings. Arrival time: 7.45am. Thank you to all members for being so cooperative over the last three weeks, as we’ve gently adopted a system (mid week evenings) that allows the early arrivals to get on the water promptly. While those whose work/school commitments just does not allow early arrival, can get the second boat out and take to the water, relaxed and happy, knowing they have not caused frustration or angst for others. Of course, this only works when there is a sweep for the second boat, so far it’s worked out so we’ll cross that bridge when we come to it. Remember if only one or two arrive late, make your way over to the platform opposite the beach and you’ll be picked up there. There is a step just below the water, step on that ready to jump in the boat. To bring the boat right up to the platform causes the hull to rub on the step – not good, but we’ll also investigate if coming into the beach that side is safe. Warm Up, stretch down exercises: an important part of training. To undertake strenuous repetitive exercise without first increasing the heart rate/blood flow and warming up the muscles, increases the risk of injury and fatigue. Those taking out the second boat – don’t forget ten minutes warm up before getting in the boat. Those heading to the platform opposite – a brisk walk or jog over the dam wall, followed by few stretches. Similarly, at end of training its important to stretch down and let everything return to resting. The Club has a duty of care to members to ensure risk is minimized – warm up/cool down exercises are part of that care – everyone, including Committee needs to be participating. You are to be on video – George Bliem is involved in an ABC radio project (yes I did say radio) he is making a two minute video – starting this Saturday. Ideally we need two boats out; could you all wear club shirts – and of course you’ll all be on your best behavior won’t you??? CNY 2011 – just so you don’t forget the buzz. who’s in seat 8, right hand side – good rotation. CHANGE OF PLANS – for the third time in 3 hours – The Ord River Training will take place this Sunday 8th. at Lake Wallace, near Lithgow. We will be leaving Orange at 8.00am. Take lunch and fluids. Dunns Swamp is a delight in store for the following week (Sunday). Why the change – think Easter, crowds, narrow water way, lots of kayakers canoeists etc and need to allow at least three hours driving to Dunn’s Swamp. Check out the web – it looks beautiful, and Ian and Rhonda who have just checked it out, assure me it is as good as it looks. All paddlers are asked to contribute $5 to meet cost of transporting the boat. As always Ord River paddlers have first preference but there will be seats in the boat for other members, so far four of the spare seats are taken. If you want to come with us to either Lake Wallace or Dunns Swamp, let me know ASAP . Expressions of Interest – in paddling Thursday mornings. Arriving 10.30, maybe have shared lunch after, if the weather is good. Hope to start Thursday 12th. Minimum of twelve paddlers needed so let me know soon as you can – don’t just assume it will happen. Alex Kastrounis – passed his driving test first attempt, well done Alex. Taylor Micaleff – is now well into studies at Charles Stuart Uni, Taylor’s mother Jo and Phil are adjusting to a smaller household – though I think Taylor is a frequent visitor home. Wendy Eggins – has taken advantage of DBNSW end of year reduction of membership fees to become the sixty first member of our club. Good to have you on board Wendy. Club Shirts – They’ve arrived so if you’re one of the people who put name down for a shirt, you’d better see Treasurer Yvonne quick smart or you’ll miss out on the size you requested. Cost is $62 each. It will be months before new order goes in so get yours now then you’re all ready for the next season. Fund Raising ­- Winner of the “100 Club” was a colleague of Ella’s, 2nd prize went to Deb Clarke of the Pan Dragons, Deb promptly requested it be used as sponsorship for George participating in the Dragons Abreast Regatta in Darwin June 03rd. Pam’s slice drive raised approximately $150. Thank you to members who supported the efforts of those raising funds to defray costs of buying the compulsory State representative uniforms. The resulting funds raised was disappointing, with the 15 Club members in the State squad receiving about $15 each. At least next year given the opportunity to be part of the State Squad again, members will be all ready kitted out. You may wonder why such fundraisers continue when Dragons Abreast Orange and the Club has recently received $12 000 from Calare Rotary. While Club members in State Rep teams lifts the profile of the Club as a whole, and makes attracting sponsorship a little easier, the Committee believes its appropriate for the Club to support small groups and/or individuals members but spending major sponsorship funds for the direct benefit of a few is contrary to good governance. It’s Club policy major sponsorship funding needs to be for major Club projects. Capital expenditure items under consideration right now, are a larger boat /equipment storage shed (a joint venture with the Triathlon Club), the purchase of a 10 seater boat, purchase of two BUKs (second hand). The Business Plan for the club sees at least one outrigger purchased by 2014! Play by the Rules – This is something a few members have done but many need to – make it a project one Tuesday evening instead of ‘on water’ training. DBNSW encourages all members to complete the training. Its free, its on line, its easy. At the end of the session you print off your certificate. If you don’t like the result – do it again and see if you can lift your score. Purpose of the training is to increase members awareness of ‘playing by the rules’. Encouraging fairness and respect among all sport participants. Go to www.playbytherules.net.au follow the prompts to ‘Participants’. When you’ve printed off your certificate, give copy to Yvonne or Pam. 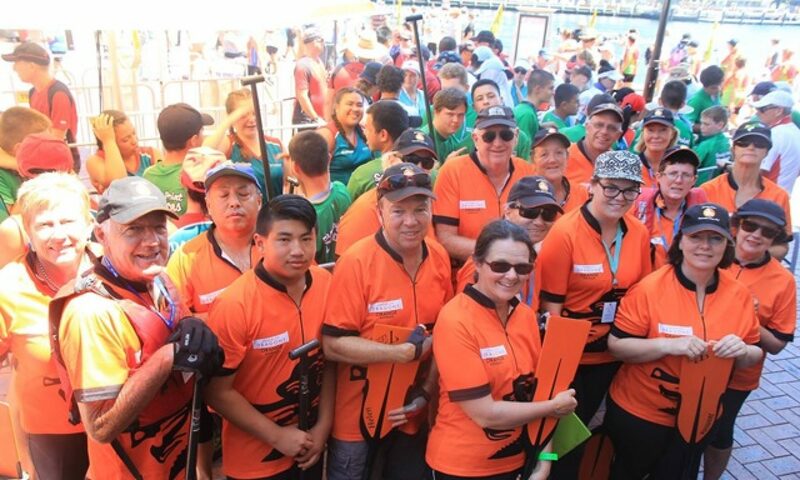 June 10th – Ord River Marathon – Last call for paddlers, there are 4 places in our boat, if you’d like to join us, contact Yvonne or I by Monday 9th at the latest.